This European river cruise in Holland gets underway in its popular, modern capital of Amsterdam. This 700-year-old city offers an abundance of classic architecture, cafés, and restaurants to explore before you embark on your river cruise through Holland and Belgium. Sail through Rotterdam’s harbor, said to be the world’s busiest port. Garden enthusiasts will delight in a visit to see the breathtaking colors of Keukenhof, also known as the “Garden of Europe.” With 70 acres of parkland and lakes, it’s one of the world’s largest flower gardens. 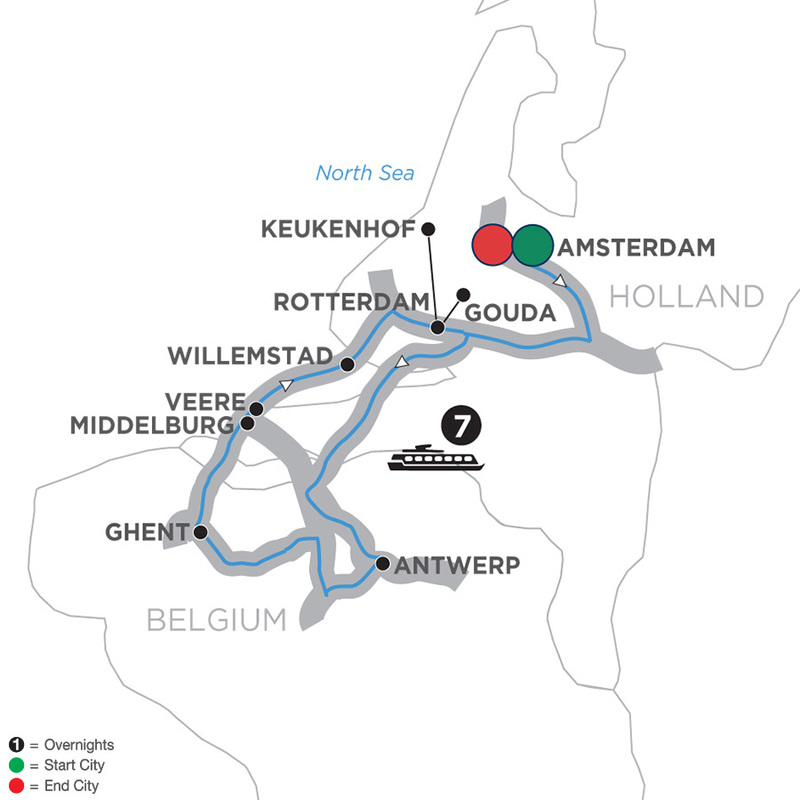 Alternatively, an excursion to the city of Gouda, famous for its cheese, is available, before sailing to Antwerp—Belgium’s second-largest city, combining ancient buildings and monuments with modern architecture.In Ghent, Belgium, join a local expert for a guided tour of the city, including a visit to St. Bavo’s Cathedral. Back in Holland, Middelburg was formerly an important trading city and you’ll get a sense of its wealth today with its impressive structures like the gothic Town Hall, Abbey Tower, and bustling Market Square. No trip to Holland is complete without a visit to the technical miracle that is the Delta Works, a storm flood barrier almost six miles long, constructed after the floods of 1953. This beautiful and historic springtime river cruise during tulip season in Holland and Belgium concludes with more chance to explore the colorful city of Amsterdam. See the most fascinating areas of the city on a canal cruise along the elegant Grachten lined with homes dating back to the city’s “Golden Age.”From seemingly unending fields of color from Holland’s gardens, to windmills and waterways of Amsterdam, to the ancient and modern mix of Belgium’s architecture, this European river cruise is sure to grow in your memory for endless seasons to come. Your day in Amsterdam is free to explore at your leisure. You may choose to join a Guided Optional Excursion to beautiful Zaanse Schans where you’ll see a wonderful collection of well-preserved historic windmills and Dutch houses. Enjoy dinner and explore the ship on your first night on board. CLASSIC Enjoy an excursion to Gouda. You’ll join a Guided Tour of the town famous for the Dutch yellow cheese that bears its name—as well as stroopwafels (syrup waffles), Gouda candles, and the beautiful city center. Take some free time to relax on the harbor-side in Rotterdam with an artisan beer, a slice of appeltart (Dutch apple pie), and a koffie verkeerd, a typical Dutch drink of half coffee, half milk. Take a bike from your ship to explore Rotterdam and the surrounding area. Before dinner, enjoy a cruise through Rotterdam harbor. Later, enjoy live entertainment on board. CLASSIC Explore Ghent—“The Diamond of Flanders" with a Guided Sightseeing Tour of this showcase of medieval Flemish wealth. You’ll visit St. Bavo’s Cathedral with its remarkable Flemish artwork. You may choose to join a Guided Optional Excursion of Bruges to explore its canals, cobbled streets, and medieval buildings. You’ll see its crisscrossed canals, the 13th-century belfry of Market Square, and charming patrician houses. A stylish 408-room hotel in the perfect location, this waterfront property offers Free Wi-Fi internet access throughout. The chic restaurant serves creative international cuisine and there is a fabulous bar serving drinks and light snacks which is also a great spot for a nightcap. For relaxation there is a Lifestyle Studio featuring a gym, Finnish sauna, bio sauna & ice fountain.